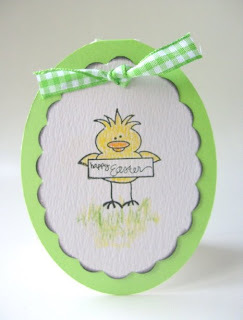 I made this card which I think would qualify for the mid-week extra on the DCM Challenge which was to make your own blooms. 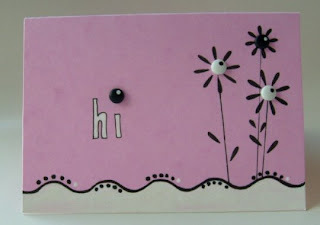 Black pigment pen, white gel pen & white acrylic paint & a kiddies stencil was used to create the blooms & wave/scallop. Black & white brads for the flower centres & dot above the 'i' A little bit of dotty doodling & handwritten sentiment. I've just realised I could do a double challenge... can I be cheeky & use this for the PTW 'Making waves.' Challenge too? Another 'side-track' or two on my tidying session.... needless to say, I have only just scratched the surface of my tidying/organising effort..lol! Sentiment handwritten. Prima flower & Jazzy Brad in the centre. I just love the haughtiness of this image, very Parisian Chic, I think. 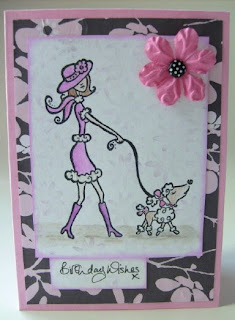 I've been tagged by Terrie http://terriebaileys.blogspot.com/ Thankyou Terrie, I'm flattered! I have to give up seven random or wierd facts about myself....ooooer! 2. I can live without fame & fortune... but, I do 'Spot the Ball' religously every week in the hope that one day I might be able to live quietly & comfortably! 4. I am just a hippy at heart. I love the simple things in life & enjoy going 'bare-foot,' a childhood habit that I've never outgrown! 5. I'm not very well travelled, having only been out of the country once, on a short holiday to France with my family. 6. Chocolate! I adore choccy bars, but hate chocolate sauce?! 7. Finally, for some reason pipe-smoke tobacco reminds me of the smell of ice-cream! Don't ask me why, it just does! Now then, who do I tag....? Dawny has very kindly given me this award... thankyou Dawny, I'm flattered! I have been having trouble putting links up for some reason, so I've decided that anyone who's listed in my fave blogs deserves this award also, along with anyone that's ever received a comment from myself.... you all help to inspire and this always helps to make my day! 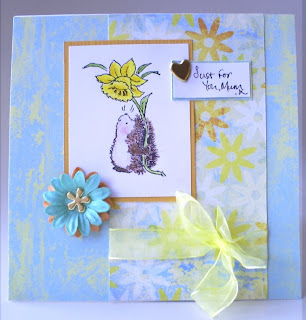 The PIF goodies were exactly right for my mum's day card, she loves daffs & hedgehogs & I knew I had some DCWV posies card somewhere that would work well with some of the bits, the image was coloured using pencil crayons, so here is the finished article. Hope all mums out there had a great mother's day, I certainly did! A jolly-jaunt around the local garden centre, followed by a carvery lunch with my nearest & dearest & when we landed at home a new camera! I can finally let my good friend & neighbour have her's back....the new one will be well tried & tested tomorrow, I've loads to catch up on & photograph.